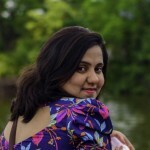 Over the years Amish has emerged as one of India’s most popular writers in English. His books have sold millions and he has been rightly hailed as India’s literary popstar. 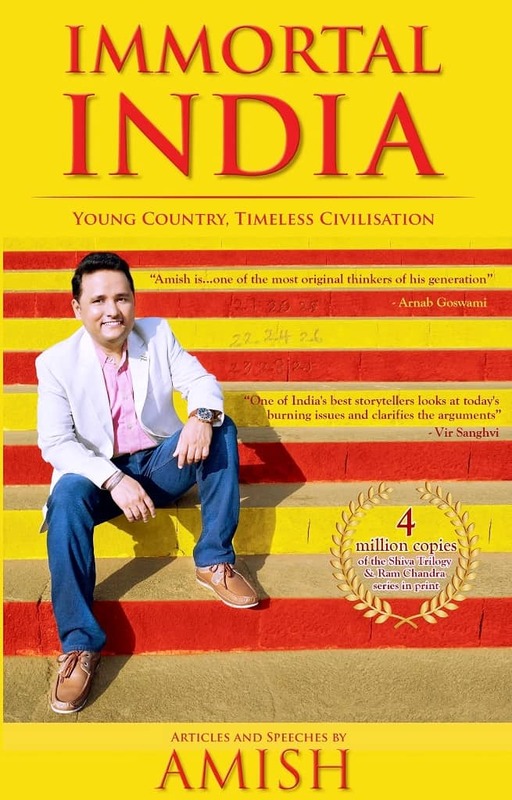 After a long stint at writing mythological fictions, Amish has finally dabbed his hands in the non-fiction genre and has come out with the book Immortal India. 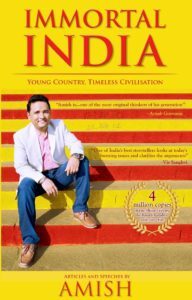 Immortal India is a collection of the various speeches, debates, and articles that Amish has written over a period of years. These articles reflect his thoughts and ideas in the most honest way possible and are an eye opener to anybody who cares to read. As can be gauged from the title Immortal India, the book hints at the ancientness of our nation. The subtitle further reads “Young Country. Timeless Civilization” and sufficiently hints at the beauty of our nation which has a young body but an immortal soul. The book is divided into various sections like Religion and Mythology, Social Issues, History and Musings each in turn containing a couple of chapters. Through the various chapters, Amish brings us closer to our nation. Some of the chapters might seem controversial but the way Amish manages to diffuse the tensions and put forth his arguments is noteworthy. He very aptly defends his Gods and at the same time revers all Gods. The main message that he brings forth in the Religion and Mythology section is that the best way of being religious is by being a liberal religious. In the next section titled Social Issues, he talks about various issues like the LGBT rights, religious conversions, casteism, money, and charity. The next section called History sees Amish reflecting on a lot of things about our history. In one such chapter, he puts forth his views regarding the Aryan Invasion theory which I think is a must read for every Indian. The chapter on the British Bombay and Aamchi Mumbai was also quite informative. Further, the last section sees Amish reflecting on his life. He talks about his writing, his spiritual journey, his son Neel, the three wise women in his life and about patriotism and personal purpose. How does the book read? If I am given only two words to describe the book, they will be – passionate and profound. Passionate because it has been written with utmost passion and that is reflected in the author’s writing. Profound because it induces thinking, provokes thoughts and maybe manages to change the reader’s outlook on a lot of issues which plague our lives and nation. It makes India come alive to the readers in a way that you can only be proud of it. Amish’s writing is simple and captivating. He does not rely on heavy words and complicated jargons but believes in simplicity and reaching out to the masses. His writing style resonates with today’s generation and that is how he is able to strike a chord with his readers in his first non-fiction book as well. The book is a result of Amish’s research and immense knowledge and that is again reflected in the various facts that he puts forward in his arguments. Overall the book is a good read and if I must say, a must read for every Indian. It is one of the best non-fiction that I have read this year and I would, therefore, recommend it to all my readers who enjoy non-fiction. Can’t wait to read it? Buy your copy at the link below!